One advances in technology in the education space is that of the humble projector. If you recall your school days, projectors were large clunky boxes that either sat on the desk or attached to the ceiling with a large iron bracket. The other thing was that they cost an arm and a leg well out of reach of most people’s pockets. However, today that has all changed, projectors have now become mini projectors and can be carried around in your pocket if need be. They can also be used at home with your smartphone to show movies, play games or share images. In this article let us consider the top 5 mini projectors currently on the market. The Philips PPX4835 is a powerful pocket projector and comes with 1280 x 720p HD resolution giving crystal clear images with high contrast. You can connect easily to your choice of notebooks, tablets, smartphones, or other mobile devices. It also doubles as a power bank, meaning you can charge your mobile devices while on the go too. The projector uses DLP technology and can project crystal-clear images and video up to 150 inches on most surfaces making it easier than ever to give engaging presentations. No matter where you are, the internal battery and the keystone correction will give you the flexibility and versatility. The unit comes complete with a built-in 3-watt speaker for clear, bright sound. The internal battery lasts 3 hours on full charge. The Nebula Capsule provides a smart cinema solution that you can enjoy anytime, anywhere and project on any surface. Using both Android and OS it can play content from your favorite video streaming app and will also mirror your phone’s screen to create a remarkably detailed picture up to 100 inches in size. The Nebula gives stunning image quality is complemented by a high quality 360° speaker to deliver heart-pounding sound giving you a great surround sound experience. The Nebula uses advanced DLP technology that utilizes IntelliBright algorithms to provide a picture up to 100 inches in size on your screen. The Nebula Capsule delivers up to 4 hours of continuous video on a single charge and quick charge technology enables the Nebula Capsule to recharge faster and also charge while in use. You can operate the Capsule directly from your phone with the ‘Capsule Control’ app available on Google Play and the App Store. One of the things the Nebula does well is easily mirror Word, Excel, PPT, and similar documents from your smart devices to be projected on any surface. This mini projector is specially designed for Business Education & Entertainment Use. It offers a Display Size of up to 120 Inches and brings you high definition images be that video or dpi pictures. It can use both the android 7.1 operation system and the OS operating system and using strong wi-fi design supports watching a mass of online videos & games. It has built-in multiple interface devices, smart devices can be interconnected with the mainstream and are great for use in the classroom or lecture theatre. The built-in 5000mAh large capacity battery gives a running time for up to more than 2 hours with a single full charge when the external power is not available. The PTV P8I is a cute, compact and portable unit and is very light and compact portable design. The ASUS S1 Short Throw mini projector is a palm-sized projector weighing only 0.75lbs and will fit easily in your pocket. The projector has a built-in rechargeable battery that provides up to 3 hours of projection time that can also be used to charge other mobile devices over USB connection. One of the unique features of the S1 is that it has a 1.1:1 short-throw lens that projects a 41-inches diagonal image at a distance of one meter. This makes it ideal for presentations on the go. The mini projector also works from the advanced DLP technology with the lamp having a 30,000-hour LED lifespan and a stunning 200 lumens of brightness. The S1 has the capability of projecting an image up to 100 inches wide. The unit comes housed in a sleek aluminum chassis with a concentric-circle finish and features an HDMI/MHL port, a USB port (for charging) and complete with the ASUS Sonic master-enhanced speaker. The Magnasonic is the world’s smallest mini projector. 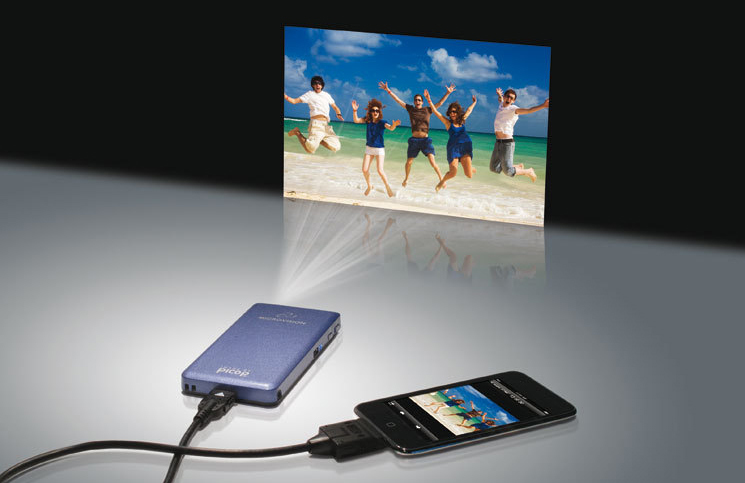 Using DLP technology the Magnasonic can bring your favorite movies, games, and video’s alive on a big screen. This high-performance pocket projector allows you to connect your laptop, smartphone, tablet, and much more. The mini projector comes with a 2-hour rechargeable battery and a built-in speaker and you can connect your other gadgets through an HDMI connection. The projector throws a crystal clear picture of up to 60 inches in size with the aid of a 25 lumen LED. The Magasonic is compatible with Micro HDMI and HDMI input right out of the box! However, if you are using Apple, MHL, and SlimPort-enabled devices they will require adapters. You can project images using your smartphone, laptop or tablet devices and because the unit has a built-in rechargeable battery it is ideal for travel and presentations on the go. A bigger sound experience can be enjoyed if you connect an external speaker through the headphone jack. We have reviewed five of the latest mini projectors that have revolutionized the world of presenting and in home entertainment. You can now enjoy that cinematic experience with technology that is compact, unobtrusive and can literally fit in your pocket!